Gazing out the plane window, I felt a bit apprehensive about Hanoi. 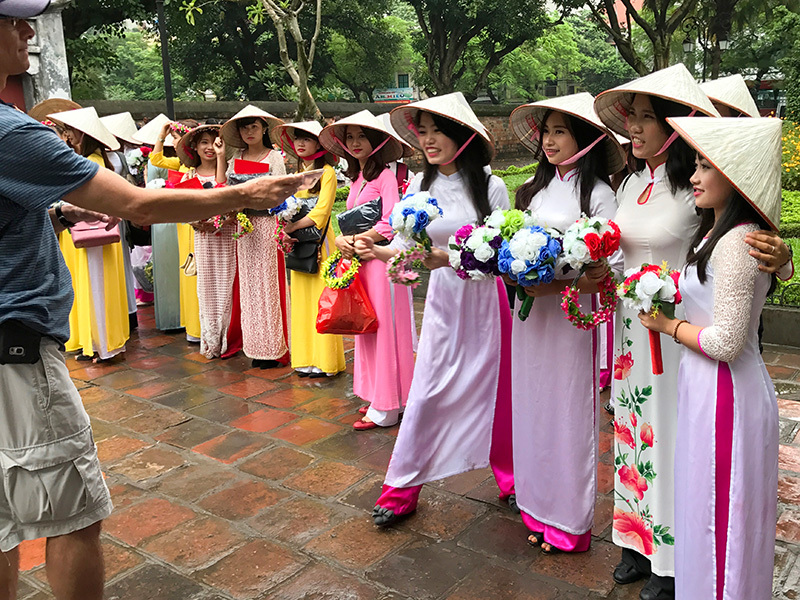 I had heard raves about travel to Vietnam for several years. But those vignettes of the Vietnam War nearly 50 years ago, served up nightly during dinner by the networks, still clung to my memory. I hadn’t served in Vietnam, as did some of my friends. The Army, instead, had shipped me off to Europe. Even so, that did little to erase the trepidation I felt on that final approach. But it was only an hour or so after landing that my apprehension began to dissipate. Once through the requisite entry procedures, I began to discover a city that was the antithesis of my thoughts high above, a city that was mesmerizing and energetic and filled with exceptionally gracious, kind, and friendly people. In fact, after two days I didn’t want to leave. Arriving on a flight from Cambodia, and after entering the airport terminal, I found the small Hanoi tourist information booth. Two friendly English-speaking young women staffed the boot and they were very helpful. They provided me with maps of the city and answered my questions. They also arranged a taxi for me for the set fee of $20, which I could pay by credit card (plus a 66¢ charge for the use of the card). That was a benefit as I had little cash on me and no Vietnamese dong, the country’s currency. Just a few minutes later a driver appeared and they handed him a sign saying “Welcome Jim Ferri” to put in his car. We encountered little traffic en route to my hotel, the Hanoi Sheridan, which I booked because I got a great room for $81 per night. It allowed me to escape the city bustle since it was a bit outside the center city. In addition, I found taxis in Hanoi to be cheap and plentiful. 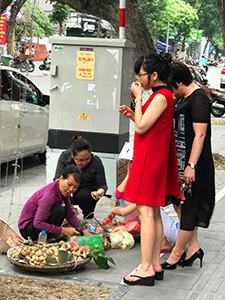 With an exchange rate of approximately 22,500 Vietnamese Dong to the dollar, I could travel almost anywhere in the city for just a few dollars. By and large, I found taxis to be an oasis in an often chaotic traffic system where swarms of motorbikes, taxis, buses, cars, trucks, rickshaws, bicycles, and everything else you can think of try to cram into a single square meter. Many of the people on the motorbikes were wearing surgical-looking smog masks, some occasionally looking designer inspired. At any rate, if you visit Hanoi, don’t be concerned about a hotel’s location. You can taxi almost anywhere around the city for $5 or less, sometimes much less. My first day in the city I headed for the Old Quarter, the liveliest commercial area in the city. Motorbikes soon whizzed by us, some carrying entire families of four or five. Further on we passed a line of sidewalk barbers, all clipping away. Women, their heads half-hidden beneath conical peasant hats, and laden down with carrying poles across their shoulders, were everywhere, selling goods from their hanging baskets. We soon arrived at Quan Chuong Gate, the only surviving gate of the original 36 that once surrounded the quarter. Upon leaving the taxi, I was quickly enveloped in a chaotic, ancient atmosphere. Arguably, the area was once of the most chaotic in the city. 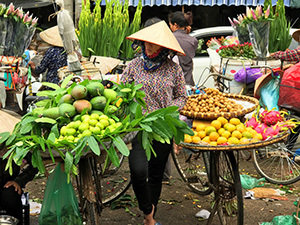 The street was filled with cars and motorbikes, with peasant-hatted women on bicycles selling flowers, oranges, and other wares. Everywhere I looked someone was peddling something. And I couldn’t quite figure out where I was. Consequently, I stopped two schoolgirls and asked the way to the market. Pointing to its location on my map, in broken English, they set me off in the right direction, after offering to show me the way. Following their directions, I reached the chaotic marketplace, the streets overflowing with both foodstuffs and humanity. Motorbikes zipped about everywhere like little mosquitoes and squatting women guarding their piles of fruits and produce along the street. It was a fantastic show, unlike anything I’d seen in some time. At any rate, if you go, leave yourself plenty of time to wander around. That morning I spent a few hours walking aimlessly around the Old Quarter, and also visited little Bach Ma Temple. 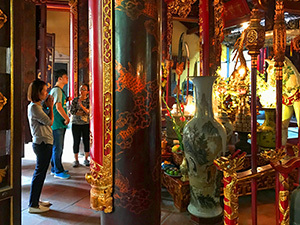 The temple is the oldest building in Hanoi’s Old Quarter and worth visiting. Many of the streets in the area are named for the trades that used to populate them. Hang Buom (Sailmakers Street) now has stores that sell local candies and sweetmeats. Hang Gai (Hemp Street) is where buy silk. Colorful Hang Ma, often considered the most colorful street in Hanoi, is the best place to buy paper goods. From the market, I walked down Hang Chieu, the main street, to where the street name changed to Hang Ma. I was a bit taken back when I reached the hand-off point: on the Hang Chieu side they were selling only vegetables; however, crossing to Hang Ma I found only colorful paper products. The change was astonishing, like night and day, and as if one was only allowed to sell certain products on each side of the street. 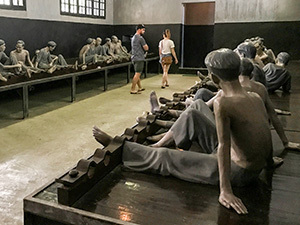 Hoa Lo Prison Museum, built by the French in 1896, is somewhat interesting in its portrayal of the history of the revolution of the Vietnamese against the French. The entire prison (only a few of the original buildings remain) is an austere place, which shows horrific conditions in partly re-created dungeon-like cells. Most Americans, on the other hand, know Hoa Lo as the infamous “Hanoi Hilton,” the name coined during the American conflict. Although it was the place where captured American pilots were imprisoned, mention of that is only made once at the entrance. Also, further into the museum, you walk through a propaganda exhibit of staged photos purportedly showing happy POWs decorating Christmas trees and having a good time. Regrettably, at that point, it became a huge disappointment to me, and I left. There’s no doubt about it: Hanoi is a city for coffee lovers. Vietnam is the second-largest coffee exporter in the world and Hanoi is flush with coffee cafés where people can enjoy the strong brew. As one might expect, it’s also a city for foodies. 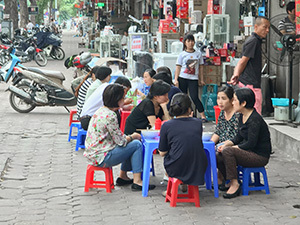 Through midmorning throughout the city, you find people sitting on little red stools eating breakfast outside cafés and shops. Come lunchtime and dinner the scene repeats itself. Furthermore, sidewalk food vendors are everywhere. Many times I passed a woman using the bottom of a 52-gallon drum as a brazier, stirring a boiling pot of noodles and dishing them out to passerby’s who frequent her little al fresco café. Small food carts and little cafés serve meals all day . In the neighborhood around St. Joseph’s Cathedral, I found countless cafés and street vendors popular with students. 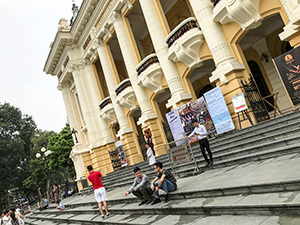 One of the most renowned parts of Hanoi is the old French Quarter where remnants of French colonialism are everywhere. Walk past the French-designed Opera House, modeled after the Paris Opera. With its palm trees, it looks as if it had been plucked off the Côte d’Azur. In fact, just walk across the street, and you’ll find crowds in a boulangerie and patisserie, a café, and a salon de thé. Walk another block over to the Metropole Hotel, long considered the most prestigious hotel in the city, if not all of Indochina. Have a coffee or drink while you admire its Art Nouveau. 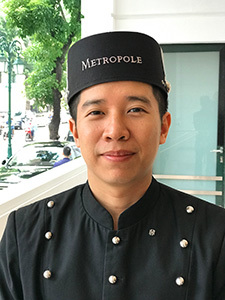 Stay at the Metropole, and you’ll be following in the footsteps of Graham Greene, Charlie Chaplin, Noël Coward and Vladimir Putin. Arguably, one of the more popular attractions in Hanoi is the Thang Long Water Puppet Theater. 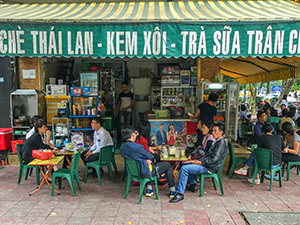 It’s across the street from Hoan Kiem Lake, considered Hanoi’s Central Park, and surrounded by a string of American and European stores. The theater hosts a show of colorful wooden marionettes that perform on the water, controlled behind the screen by puppeteers with bamboo poles. It all dates from the 11th century when farmers would perform puppet shows during the rainy season. Although I couldn’t understand what was being said or sung, I still found it interesting and colorful. Take an hour to see it, and judge for yourself. 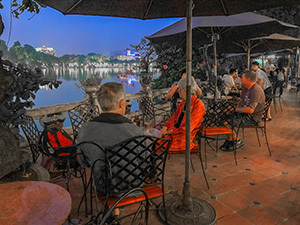 I enjoyed a different side of the city along the shores of Hoan Kiem Lake, accross the street from the puppet theater. 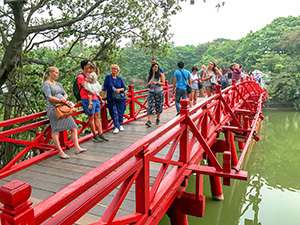 Join the Vietnamese on a walk on the picturesque, bright-red Sunbeam Bridge out to a small temple on an island. Afterward, just take a walk along the shore. A walk along the lake in the evening is quite interesting, and it seems to be the place to which people gravitate. It’s a lively section of town made even more so by all the Vietnamese mixing in with the tourists. Of course, it also draws vendors selling little knickknacks for a dollar or two. Walking along the street, I passed an ice cream–beer–pastry stand doing a brisk business. When I stopped for a moment to admire the view, a mother on a motor scooter with her three children parked on the sidewalk next to me. A boy jumped off and said to me “Hello! What’s your name?” and then ran off. His mother smiled at me before she goes after him. Watching them take off, I walked into the lakeside Thuy ta Café to have a Tiger beer and enjoy the view. The bill came to about $2.50, boosted no doubt by the view I’m enjoying. Elsewhere in Hanoi, the cost would be one-tenth the price. 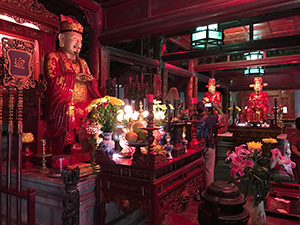 By and large, one of the most pleasant places I visited was the nearly 950-year-old Temple of Literature, one of the most renowned sites in Hanoi. Built by Vietnam’s Chinese rulers as a shrine to Confucius, it was also a school for mandarins and became Vietnam’s first University. When I arrived I was met by hundreds of happy and gleeful students in their caps and gowns. In addition, many of the girls were also dressed in colorful dresses and carried flowers. They had come to give thanks to Confucius since it was graduation day. Of course, it was an important thing for them to do. In the meantime, as they had photos taken, I walked up across the main courtyard, one of five, and found the altar to Confucius. There people were bringing food and other offerings to Confucius, and placing them on top of the altar. The scent of incense filled the air, and on each side of the altar stood 9-foot tall, large brass birds. On their breasts above a Chinese inscription, people rubbing them for good luck had worn the patina away. 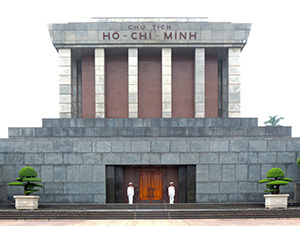 I found Ho Chi Minh’s final resting place, a mausoleum on Ba Dinh Square, less colorful. There the Vietnamese leader is interred, à la Lenin, in a glass sarcophagus. The museum/mausoleum, an enormous concrete and granite structure, is austere with white-suited soldiers standing guard at the main entrance. Regrettably, I never got to visit the Mausoleum since I arrived at the period (September through November) when Ho’s body is shipped off to Moscow for touch-ups. At any rate, if you’re interested in seeing the mausoleum, time your visit better. And in any case, also plan to stay in Hanoi longer than 48 hours.